How do you deliver a lecture on Marketing 101 in under an hour without putting people to sleep? Why with ice cream of course! I was asked deliver a presentation to the City of Auburn, WA Economic Development forum on Marketing 101 for small businesses. I struggled for a while and then figured out a way to combine a subject that I’m passionate about and a desert that is delicious. Here is a summary of that presentation. When I tell small businesses that I offer marketing services, I often hear “that’s OK – I don’t need advertising.” But marketing is much more than advertising. 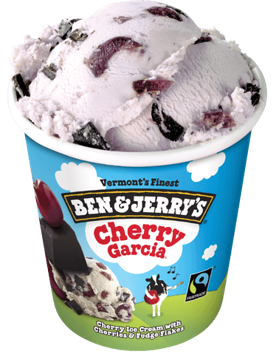 Using the “4P’s” model, here is the Cherry Garcia / Ben & Jerry’s view: Product: Awesome ice cream Price: Premium Promotion: Website, social media, mail Place: Ben and Jerry’s stores, grocery stores, catering trucks Product – What Are They Selling? In a 2014 Consumers Report, Ben and Jerry’s had one of the highest ratings with a cost per serving of $1.03. This price was right up there with Haagen-Dazs, and much higher than Kirkland (Costco) ice cream which sells for $0.30 per serving. Due to Ben and Jerry’s high brand value, they are able to maintain a premium pricing that is reflective of that brand. You can get 8 pints of Cherry Garcia delivered in dry ice from Amazon! You can also get it from Ben and Jerry’s stores, grocery stores and even a Ben and Jerry’s catering truck. Going Strong Ben and Jerry’s continues to go strong since their humble beginnings in 1978. They have adapted to changing market forces such as fat free, sugar free, gluten free, global warming and no GMOs. They continue to thrive even with new competitors and new technologies. This is marketing at its best.